This article is about the British noble family. For other people with the surname, see Spencer (surname). For other uses, see Spencer (disambiguation). The funeral honours of Sir John Spencer, Kt. (1546–1599). 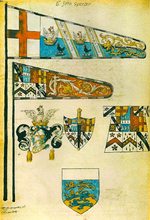 He displays both the Despencer arms, adopted after c. 1595 and the blue and white arms granted in 1504. The House was founded in the 15th century by Henry Spencer (died c. 1478), from whom all members descend. 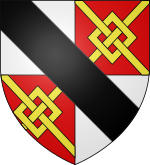 In the 16th century the claim arose that the Spencers were a cadet branch of the ancient House Le Despencer, though this theory has since been debunked, in particular by J. Horace Round in his essay The Rise of the Spencers. The Spencers were first granted a coat of arms in 1504, "Azure a fess Ermine between 6 sea-mews’ heads erased Argent," but this bears no resemblance to the arms used by the family after c. 1595, which were derived from the Despencer arms, "Quarterly Argent and Gules in the second and third quarters a Fret Or overall on a Bend Sable three Escallops of the first" (the scallops standing for the difference as a cadet branch). Round argued that the Despencer descent was fabricated by Richard Lee, a corrupt Clarencieux King of Arms. Citing Round, The Complete Peerage dismissed the alleged Despencer descent as an "elaborate imposture" which "is now incapable of deceiving the most credulous." A close relative of Henry Spencer (died c. 1478) was John Spencer, who in 1469 had become feoffee (trustee) of Wormleighton in Warwickshire and a tenant at Althorp in Northamptonshire in 1486. His nephew, Sir John Spencer (died 1522), first made a living by trading in livestock and other commodities and eventually saved enough money to purchase both the Wormleighton and Althorp lands. Wormleighton was bought in 1506, the manor house was completed in 1512. In 1508, Spencer also purchased the estate of Althorp with its moated house and several hundred acres of farmland. He had grazed sheep here from the 1480s. Impressed by the quality of the land, he eventually bought it and rebuilt the house in 1508. At that time, his estate and mansion in Warwickshire were considerably larger, and the house in Wormleighton was four times the size of Althorp. In 1511 he made further purchases to acquire the villages of Little Brington and Great Brington as well their parish church of St Mary the Virgin, from Thomas Grey, 2nd Marquess of Dorset. By putting down roots at Althorp, Spencer provided what was to become a home for the next 19 generations. In 1519 he was knighted by King Henry VIII, died three years later and was buried in the new family chapel at Great Brington. The Spencers rose to opulent prominence during the 16th century. Sir John Spencer's grandson Sir John Spencer (d. 1586) was a Knight of the Shire for Northamptonshire. The Spencers’ administration of their Northamptonshire and Warwickshire estates was admired and often emulated by gentlemen all over England. Sheep from their pastures were purchased for breeding and it is probable that the family's success as farmers was rarely equalled in the century. In the late 16th century, the latter Sir John Spencer's grandson Sir Robert Spencer (1570–1627) represented Brackley in Parliament. In 1601, he was made a Knight of the Garter, and created Baron Spencer, of Wormleighton, in the Peerage of England in 1603. During the reign of King James I he was reputed to be the richest man in England. The humble origins of the Spencers as sheep farmers once caused a heated exchange of words between wealthy yet then upstart Spencers with the more established Howards whose FitzAlan ancestors had been the Earls of Arundel since the 13th century. During a debate in the House of Peers, Lord Spencer was speaking about something that their great ancestors had done when suddenly the Earl of Arundel cut him off and said "My Lord, when these things you speak of were doing, your ancestors were keeping sheep". Lord Spencer then instantly replied, "When my ancestors as you say were keeping sheep, your ancestors were plotting treason." Robert Spencer, 1st Baron Spencer, was succeeded in his peerage and estates by his eldest surviving son, William. He had previously represented Northamptonshire in Parliament. Two of his sons received additional peerages: His eldest son, Henry (1620–1643), succeeded as 3rd Baron Spencer in 1636 and was created Earl of Sunderland in the Peerage of England in 1643. The younger son, Robert (1629–1694), sat in the House of Commons from 1660 to 1679 and was created Viscount Teviot in the Peerage of Scotland in 1685. 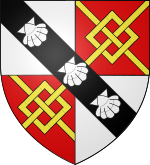 The senior branch of the Spencers (later known as the Spencer-Churchill family) is currently represented by His Grace Jamie Spencer-Churchill, 12th Duke of Marlborough, direct descendant via the eldest male-line of Sir John Spencer, who was knighted by King Henry VIII in 1519 while the cadet branch of the family, the Spencers of Althorp who descends via the male-line from the younger son of the 3rd Earl Sunderland is represented by The Right Honorable Charles Spencer, 9th Earl Spencer. Robert Spencer, 2nd Earl of Sunderland was Lord President of the Council from 1685 to 1688 and a Knight of the Garter. His son Charles, 3rd Earl of Sunderland, was Lord-Lieutenant of Ireland, Lord Privy Seal, Secretary of State for both the Northern and Southern Departments, Lord President of the Council, First Lord of the Treasury and a Knight of the Garter. His second wife was Lady Anne Churchill, the second daughter of the distinguished soldier John Churchill, 1st Duke of Marlborough. After Churchill's death in 1722, the Marlborough titles first passed to his eldest daughter Henrietta (1681–1733), then to Anne's second son, Charles. After the death of his elder brother, Robert, in 1729, Charles Spencer had already inherited the titles of 4th Earl of Sunderland and Baron Spencer of Wormleighton as well as the Spencer family estates. In 1733, he succeeded to the Churchill family estates and titles and became the 3rd Duke of Marlborough as well as a Knight of the Garter, while the Spencer estates in Bedfordshire, Northamptonshire (including Althorp) and Warwickshire passed to his younger brother John (1708–1746). In 1815, Francis Spencer, the younger son of George Spencer, 4th Duke of Marlborough, was created Baron Churchill, of Wychwood in the County of Oxford, in the Peerage of the United Kingdom. In 1902, his grandson, the 3rd Baron, was created Viscount Churchill, of Rolleston in the County of Leicester, also in the Peerage of the United Kingdom. In 1817, George Spencer, 5th Duke of Marlborough, obtained permission to assume and bear the additional surname of Churchill in addition to his own surname of Spencer, in order to perpetuate the name of his illustrious great-great-grandfather. At the same time he received Royal Licence to quarter his paternal arms of Spencer with the coat of arms of Churchill. The modern Dukes of Marlborough thus originally bore the surname "Spencer". 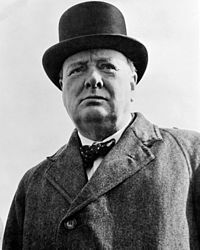 The double-barrelled surname of "Spencer-Churchill" as used since 1817 has remained in the family to this day, though some members have preferred to style themselves merely "Churchill". The 7th Duke of Marlborough was the paternal grandfather of Sir Winston Churchill (1874–1965), the British prime minister. The latter's widow, Clementine (1885–1977), was created a life peeress in her own right as Baroness Spencer-Churchill in 1965. The family seat of the Dukes of Marlborough is Blenheim Palace in Woodstock, Oxfordshire. Most Spencer-Churchills are interred in the churchyard of St Martin's Church, Bladon, a short distance from the palace; only the Dukes and Duchesses are buried in the Blenheim Palace chapel. In 1761, John Spencer (1734–1783), a grandson of the 3rd Earl of Sunderland, was created Baron Spencer of Althorp and Viscount Spencer in the Peerage of Great Britain by King George III. In 1765, he was further created Viscount Althorp and Earl Spencer, also in the Peerage of Great Britain. In 1755, he had privately married Margaret Poyntz (1737–1814) in his mother's dressing room at Althorp. They had five children, including the 2nd Earl Spencer, who later became Home Secretary from 1806 to 1807 and a Knight of the Garter. His older son, the 3rd Earl Spencer was Chancellor of the Exchequer under Lord Grey and Lord Melbourne from 1830 to 1834. The 2nd Earl's youngest son George (1799–1864) converted from Anglicanism to the Roman Catholic Church, became a priest and took the name of "Father Ignatius of St Paul". He worked as a missionary and is a candidate for beatification. His older brother, who eventually became the 4th Earl Spencer, was a naval commander, courtier and Whig politician. He initially served in the Royal Navy and fought in the Napoleonic Wars and the Greek War of Independence, eventually rising to the rank of Vice-Admiral, and was made a Knight of the Garter in 1849. His son, the 5th Earl Spencer, who was known as the "Red Earl" because of his distinctive long red beard, was a close friend of prime minister William Ewart Gladstone. He served twice as Lord Lieutenant of Ireland and was made a Knight of the Garter in 1864. He was succeeded in 1910 by his half-brother, the 6th Earl Spencer, who had been made Viscount Althorp, of Great Brington in the County of Northamptonshire, in the Peerage of the United Kingdom, in 1905 and served as Lord Chamberlain from 1905 to 1912. He became a Knight of the Garter in 1913, and was succeeded in the earldom and estates by his son, the 7th Earl Spencer, in 1922. His son, the 8th Earl Spencer, succeeded to the earldom and estates in 1975. He married the Honourable Frances Ruth Roche in 1954 and had a daughter, Diana, who later married Prince Charles in 1981. The family seat of the Earl Spencer is Althorp in Northamptonshire, their traditional burial place is the parish church of St Mary the Virgin Church, Great Brington. The family estate includes significant land holdings in other parts of the country, including the village of North Creake in Norfolk. Their third son William was a landowner in Yarnton, Oxfordshire; his son Thomas was created Baronet of Yarnton in 1611. Their fourth son Richard was the ambassador of James I to the Dutch Republic; his son, John, was a landowner in Great Offley, Hertfordshire and was created Baronet of Offley in 1627. Robert Spencer, 1st Baron Spencer (1570–1627), married Margaret, daughter of Sir Francis Willoughby (1547-1596), Kt. 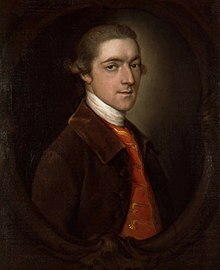 George Spencer-Churchill, 5th Duke of Marlborough (1766–1840), elder son of the 4th Duke, changed his surname from "Spencer" to "Spencer-Churchill"
Jane Spencer, daughter of Sir William Spencer (1483–1558) of Wormleighton and Althorp, married Sir Richard Brydges, Kt. Alice Spencer (1559–1637), daughter of Sir John Spencer (1524–1586), married Ferdinando Stanley, 5th Earl of Derby. Their daughter Anne (1580–1647) was heiress presumptive to the English throne upon the death of Elizabeth I according to the will of Henry VIII and the Third Succession Act. As Lady Derby, Alice was a noted patron of the arts and to whom poet Edmund Spenser represented the character "Amaryllis" in his eclogue Colin Clouts Come Home Againe in 1595 and dedicated his poem The Teares of the Muses in 1591. Diana, Princess of Wales (born Lady Diana Spencer), daughter of the 8th Earl Spencer, married in 1981 Charles, Prince of Wales, and had issue. Clarissa Spencer-Churchill, daughter of Jack Spencer-Churchill (younger brother of Sir Winston Churchill), married Sir Anthony Eden, Prime Minister of the United Kingdom. Sir Winston Churchill (1874–1965), Prime Minister of the United Kingdom, grandson of the 7th Duke of Marlborough, married Clementine Hozier (1885–1977), later a life peeress in her own right as Baroness Spencer-Churchill. The 9th Duke of Marlborough married Consuelo Vanderbilt, member of the prominent American Vanderbilt family. The 11th Duke of Marlborough married in 1961 Athina Livanos, former wife of Aristotle Onassis. In 1972 he married Countess Rosita Douglas-Stjernorp, daughter of Swedish nobleman and diplomat Count Carl Douglas-Stjernorp. They were divorced in 2008. Her elder sister Elisabeth (b. 1940) is married to Prince Max, Duke in Bavaria, heir presumptive to the Headship of the Royal House of Bavaria. As an artist, she is known professionally as Rosita Marlborough. Mary Spencer-Churchill, daughter of Sir Winston Churchill, married Christopher Soames, Baron Soames, and was made a Lady of the Garter in 2005. The 7th Earl Spencer, when heir to the earldom and styled Viscount Althorp, married in 1919 Lady Cynthia Hamilton, daughter of the 3rd Duke of Abercorn. The 8th Earl Spencer, when heir to the earldom and styled Viscount Althorp, married in 1954 the Hon. Frances Ruth Roche, daughter of the 4th Baron Fermoy. The 9th Earl Spencer, then Viscount Althorp, married Victoria Lockwood, a British fashion model, in 1989. They divorced in 1997. He married his third wife Karen Gordon, a Canadian philanthropist, in 2011. Lord Charles Spencer (1740–1820), second son of the 3rd Duke of Marlborough, was Postmaster General of the United Kingdom from 1801 to 1806 and Master of the Mint in 1806. William Robert Spencer (1769–1834), younger son of Lord Charles Spencer, became a poet and wit. Aubrey George Spencer (1795–1872), son of the poet William Robert Spencer, became the first Bishop of Newfoundland in 1839, later Bishop of Jamaica. George John Trevor Spencer (1799–1866), son of the poet William Robert Spencer, became Bishop of Madras in 1837. George Spencer (1799–1864), son of the 2nd Earl Spencer. He was first an Anglican priest, converted to Catholicism to become a Roman Catholic priest as Father Ignatius, worked as a missionary and is now a candidate for beatification. General Sir Augustus Almeric Spencer, GCB (1807–1893), third son of Francis Almeric Spencer, 1st Baron Churchill (1779–1845). Lord Randolph Henry Spencer-Churchill, publicly known as Lord Randolph Churchill (1849–1895), son of the 7th Duke of Marlborough, Chancellor of the Exchequer and Leader of the House of Commons, father of Sir Winston Leonard Spencer Churchill. The Reverend Canon Henry Spencer Stephenson, M.A. (1871-1957), Chaplain to King George VI and Queen Elizabeth II. Randolph Frederick Edward Spencer-Churchill, publicly known as Randolph Churchill (1911–1968), son of Sir Winston Leonard Spencer Churchill. Many members of the Spencer family have also been knights or dames of the Order of the Garter. The following is a list is of all Spencer members of this order, across all branches of the family, along with their year of investiture. ^ The Complete Peerage, vol. 4, p. 259. See also the Nov. 1902 edition of The Ancestor Quarterly, which described the Spencers as "that pushful house of shepherd kings" with a "brand new and more than doubtful pedigree." Sounding a more gentle tone, Don Steel in the March 1996 edition of Soul Search noted sadly that the pedigree forgery "obscures the real achievement of the Spencers of Althorpe. Alone, perhaps among the English nobility, the Spencers owed their riches and their rise not to the favour of a king or to the spoils of monasteries, nor even to a fortune made in trade, but to successful farming." ^ Round, J. Horace (1901). "The Spencers and The Despencers". The Baronage. The Baronage Press Ltd and Pegasus Associates Ltd. Retrieved 1 January 2017. So it was Clarencieux King of Arms who foisted this pedigree on Sir John Spencer in 1595. The family had, by that time, largely increased its wealth, for Sir John's mother was a daughter of the well-known Sir Thomas Kytson, who had acquired a great fortune as a mercer in London. 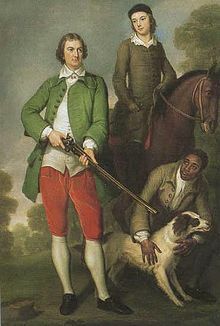 Lee, to whom Queen Elizabeth said that "if he proved no better" than his predecessor Cooke, Clarencieux, "yt made no matter yf hee were hanged," must have felt that it was Sir John's duty to "pay, pay, pay" for a new pedigree and coat. For a hungry King of Arms he was a marked man. Now we can understand how it was that the monument erected in or after 1596 displays the Despencer coat, while those already existing in the interesting Spencer chapel became bedecked, right and left, with the fruits of Lee's discovery. When the heralds next visited the county (1617-8), the new baronial pedigree was entered in all its splendour. The shepherd peer was now of the stock of "ye Earles of Winchester and Glocester." A year later he had soared higher; he was in direct male descent from "Ivon Viscount de Constantine," who had married, even before the Conquest, a sister of the "earl of Brittany." And now let me once more insist on the modus operandi of Clarencieux Lee, the original rascal and the "onlie begetter" of this precious pedigree. He took from the records Spencers and Despencers wherever he could lay hands on them, fitted them together in one pedigree at his own sweet will, rammed into his composition several distinct families, and then boldly certified the whole as gospel truth. It is needless, after this exposure, to pursue further. We are, once more, simply dealing with one of those lying concoctions hatched within the walls of the Heralds' College, certified by its Kings of Arms, and still "on record" among its archives. This, be it observed, is no case of a tradition rashly or credulously accepted. Clarencieux compiled the pedigree, as he said he had done, from records; but, with these records before him, he deliberately and fraudulently invented a descent which their evidence proves to be false. He knew, therefore, perfectly well that what he officially certified to be true was a lie of his own invention. Recorded by Vincent at the Visitation of 1617, accepted by Garter Segar, certified by Garter Heard: even in the present century, this impudent concoction is an instance of what we owe to the College of Arms. The pedigrees with which it is hardest to deal are those in which fact and fiction are cunningly intertwined. Here, for instance, it is perfectly true that John le Despencer married Joan, daughter (and heiress) of Robert le Lou (Lupus), who brought him the manor of Castle-Carlton, Lincolnshire. This we learn from the Lincolnshire Inquest taken after his death, which proves that Joan died without surviving issue, and that John held the manor, by the courtesy of England, until his death. John himself had inherited the manor of Martley, Worcestershire, which had been granted to his father by Henry III. The heralds must have seen the difficulty caused by its not descending to his alleged sons, but being, on the contrary, afterwards found in the hands of the Hugh Despencers. For they "doctored" the pedigree accordingly. But their real crime was providing John with a wholly fictitious second wife, in order to make him the father of men with whom he had nothing to do. ^ Round, J. Horace (1901). "The Spencer Family". The Baronage. The Baronage Press Ltd and Pegasus Associates Ltd. Retrieved 1 January 2017. In 1504, John Spencer, an innovative and entrepreneurial yeoman, considered himself sufficiently successful to justify petitioning for a grant of arms. He was awarded Azure a fess Ermine between 6 sea-mews' heads erased Argent and could thenceforward be accounted a gentleman. (He was subsequently knighted by Henry VIII. ) At this time English society was still restructuring itself after the turmoil of the Wars of the Roses, and the gentry and the peerage were being restocked with new families seeking gentility. If at this time, 1504, John Spencer had any thought that he might be descended from the great mediaeval family of the Despencers, if there had been any legend among his kinsmen that this could be so, if there had been any chance that the suggestion would be taken seriously by the heralds, then he must have asked for arms similar to those of the Despencers and a note of his request and of its grounds would have been made in the records. As it was, the arms he was awarded could hardly be more dissimilar from those of the Despencers (here on the right), and there is no note. The arms granted in 1504 were used at least as late as 1576, and probably remained so in use until 1595, the year Richard Lee, Clarenceux King of Arms, visited the Spencer seat at Althorpe and "discovered" the family's descent as cadets of the great Despencers. The consequences of this visit included a monument to the memory of his host's father being erected with the ancient Despencer arms (with the addition of three escallops in bend) displayed instead of the Spencer arms, and an earlier monument to the 1504 grantee, the first Sir John Spencer, having the 1504 Spencer arms removed and replaced with the Despencer arms. This rewrote history. ^ "The Hon. George Spencer". Catholic Encyclopedia. Retrieved 30 May 2013. Round, J.H. (1901) Studies in Peerage and Family History, A. Constable and Company, London.